The NF-R8 is the first fan employing a novel 80mm rotor which was developed by the Austrian Institute for Heat-Transmission and Fan Technology (?sterreichisches Institut f?r W?rme?bertragung und Ventilatorentechnik, ?IWV). Thanks to the special optimisation of the blade geometry towards ultra low noise application, the NF-R8 is up to 10% more quiet than current high-end fans at the same flow rate. The NF-R8 series are equipped with a magnetically centred, self lubricating oil-pressure bearing that provides a new level of quietness and long-term stability. Other Thoughts: Make sure you have enough of them to move enough air when they are at their quietest. Pros: Cools well, and is perfect for smaller heatsinks. Very Quiet, adjustable with included in-line plugs. Pros: Very Very quiet compared to other 80mm fans, very please with the purchase. Cons: Rubber screws are hard to pull through on smaller cases, ended up breaking one on accident & boxes came in a little dented. Pros: Super quiet! Mounted in a case and running 2 of these guys alone as in picture. The room reads at between 42 and 48 db. With the meter exactly one foot above the fans the meter doesn't change. That is full speed not with the rpm limiting cables included. No one, absolutely no one can say these fans can be heard over a fan cooled GPU, CPU, or closed loop market liquid cooling system. Quietest 80mm fans I have ever tested. Other Thoughts: Noctua could add a little color to maybe match case interiors but honestly dose not need to for me to keep using them on most builds. Pros: Absolutely quiet. Even when at full speed, I could not hear it. I use it to cool my 850 Pro 256Gb. Other Thoughts: The quality of Noctua products has no equal. I don't mind the price, and I can't see it so the color is a non issue. Worth every penny. 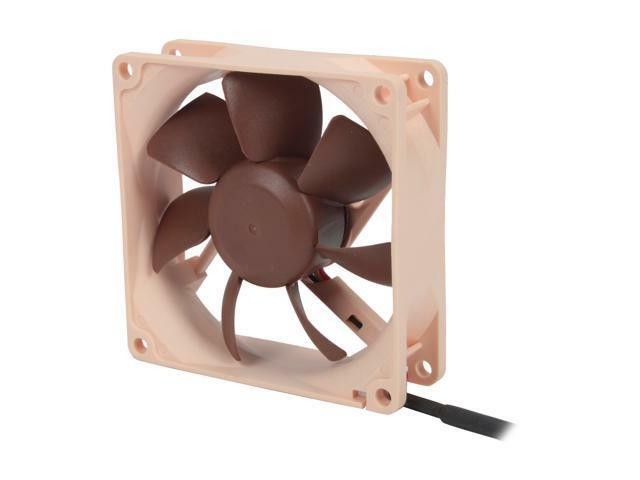 I am tempted to see if my other fans can be replaced with Noctua's. Other Thoughts: I did the Tripp-Lite UPS mod that is published on various internet forums and replaced the single-speed two-wire fan in my large UPS with this NOCTUA NF-R8 and the Noise Magic NMT-3 speed control. For my UPS this was an easy change and the sound level difference is stunning. Even with the fan at idle I can feel air entering the inlets, and I have yet to really hear the fan kick into high gear. I am going to keep one or two of these fans and controllers on the shelf in my workshop and reaplce ANY single speed fan I enounter on the bench.